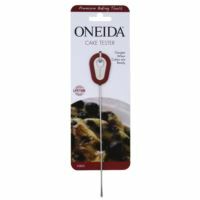 Helps Gauge When Baked Goods Are Ready. 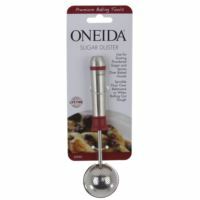 Insert into Center of Brownies, Cakes or Cupcakes. Hand Wash.
Use for filling cupcakes and muffins. 3 sizes (mini, standard, large). 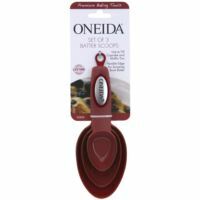 Flexible edge to scrape bowl batter. Ring holds cups together. 4 pc. Nesting. Circle, Heart, Flower, Hexagon. 18/8 Premium Stainless Steel Handle. 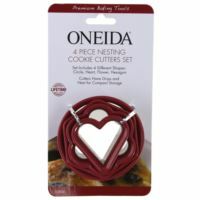 Nylon Head is Safe for Non-Stick and Heat Resistant to 400 F. Dishwasher Safe. 18/8 Premium Stainless Steel Handle. 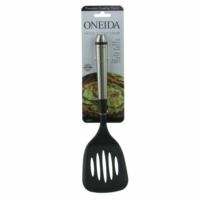 Nylon Head is Safe for Non-Stick Surfaces. 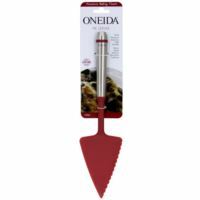 Serrated edge for cutting. Dishwasher Safe. 18/8 Premium Stainless Steel Handle. 2" Width, Natural Boar Bristle. Dishwasher Safe. 18/8 Stainless Steel Handles. Nylon is heat resistant to 450 ?F. Dishwasher Safe. High-carbon and taper ground blades offer superior cutting performance. Blades resist rust, stains and pitting. Fully forged bolster for superior balance. Protects your hand from accidental slips across the blade. Stainless tang and rivets for durability, control and safety. 18/8 Premium Stainless Steel Handle. 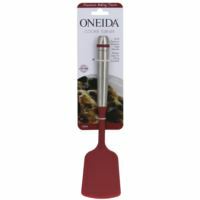 Flexible Silicone Head is Heat Resistant to 400 F. Dishwasher Safe. 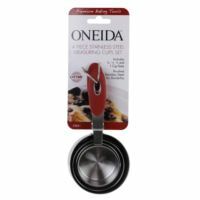 5 Sizes: 1/4, 1/3, 1/2, 3/4 and 1-Cup. Nest for Easy Storage. Ring Holds Cups Together. Dishwasher Safe. 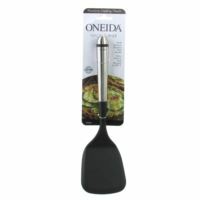 Clear Body with Soft Grip Handle and Non-slip Bottom. Offers Precise Readings when Viewed from Above. 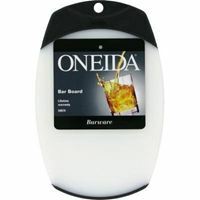 BPA Free, Hand Wash Only. 18/8 Stainless steel handle. 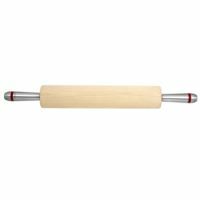 Creates straight or fluted edges on dough. 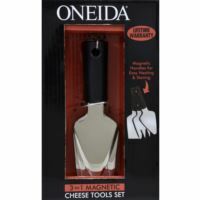 Includes 3 Tools in 1 (Cheese Fork, Soft Cheese Spreader; Hard Cheese Tool). Magnetic handles nest together for easy storage. 6 Inch Tools offer PP Handles and Stainless Steel Blades. Great for entertaining. Hand wash only due to magnetic properties. 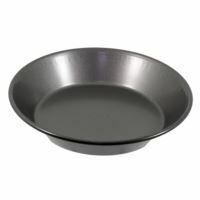 Select 9" Deep Dish Pie Pan. Heavy Duty Carbon Steel Construction (.8mm). Whitford Xylan non-stick coating offers easy release of baked goods and easy clean-up. Oven safe to 400 degrees. Dishwasher Safe. Made without PFOA, Lifetime warranty. Simply Sweet 17" X 12" Cooling Rack. Carbon Steel Construction. Whitford Silicone Non-Stick Coating for Easy Clean Up. Oven safe to 400 degrees. Dishwasher Safe. Made without PFOA, Lifetime warranty. Includes; 1/4, 1/2, 1Tsp. And 1 Tbsp. Brushed Stainless Steel with gripped handle. 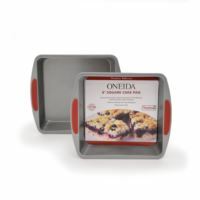 Non-stick 9" x 13" x 2" cake pan with cover. Carbon Steel Construction. Whitford Silicone Non-Stick Coating for Easy Clean Up. Oven safe to 400 degrees. Dishwasher Safe. Made without PFOA, Lifetime warranty. 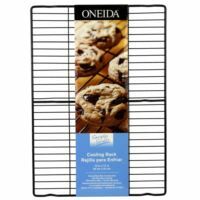 Set includes small (9" x 13"), medium (10" x 15") and large (11" x 17") cookie sheets. Carbon Steel Construction. Whitford Silicone Non-Stick Coating for Easy Clean Up. Oven safe to 400 degrees. Dishwasher Safe. Made without PFOA, Lifetime warranty. Set includes 8", 9", and 10" pans. Each pan is 3" deep. Carbon Steel Construction. Whitford Silicone Non-Stick Coating for Easy Clean Up. Oven safe to 400 degrees. Dishwasher Safe. Made without PFOA, Lifetime warranty. 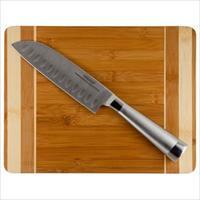 18/8 Premium Stainless Steel Handle. Long Length - 11.75" Wood Barrel. Heavy Duty Bearings for Smooth Rolling. Hand Wash and Dry. 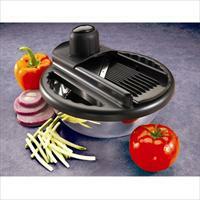 Makes slicing easy, clean and quick. 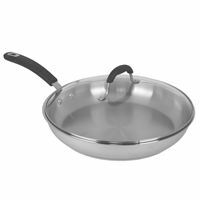 1-Qt Stainless Steel Bowl, lid. 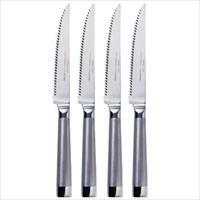 4 interchangeable stainless steel blades. thick & thin, 2 julienne blades. 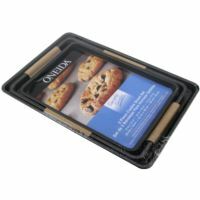 Secure cover, safety food holder. Dishwasher Safe, Ltd Lifetime Warranty. 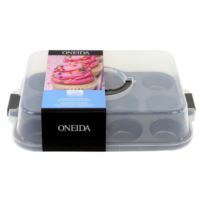 Non-Stick 12 Cup Muffin Pan with clear plastic locking cover. Carbon Steel Construction. Whitford Silicone Non-Stick Coating for Easy Clean Up. Oven safe to 400 degrees. Dishwasher Safe. Made without PFOA, Lifetime warranty. 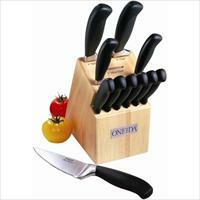 Set Includes: Four 4.5-Inch Serrated Steak Knives. Side Tang Handle. Double Bevel Cutting Edge. Fully Forged Construction. Labeled Blades. Shears separate for easy cleaning. 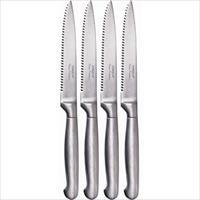 Set Includes: Four 4.5-Inch Serrated Steak Knives. 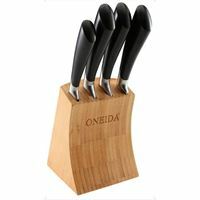 Steak Knife Block Separates from Main Block. Stainless Steel Triple Rivet. Double Bevel Cutting Edge. Fully Forged Construction. Labeled Blades. Shears separate for easy cleaning. 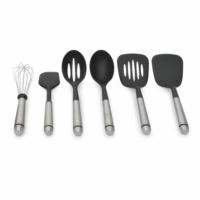 Everything a chef needs in a tool set. Bamboo Slotted Turner & Basting Spoon. 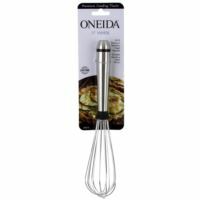 Stainless Steel Whisk & Ladle. 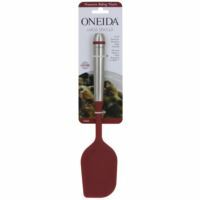 Nylon Head Turner & Basting Spoon. Black enamel coated Crock. Dishwasher safe, hand wash for Bamboo. Limited Lifetime Warranty. Aluminum encapsulated base heats quickly and spreads heat evenly. 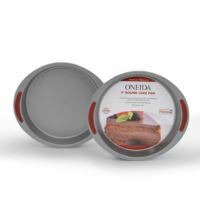 Tempered glass lids allow for monitoring the cooking process without lifting lids and releasing moisture. 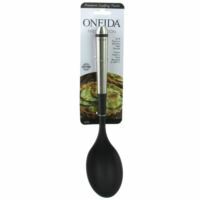 Solid stainless steel riveted handles with soft grip sleeve. Non-reactive Stainless Steel vessels with brilliant mirror polish finish. 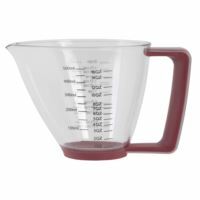 Rim is tapered for drip-free pouring. Dishwasher Safe, Oven Safe to 350 degrees Fahrenheit. Uses: Gas, Electric, Induction, Halogen, Ceramic. 10 year Warranty, Packaging features English/Spanish. Heavy Gauge Forged Aluminum vessels promote fast and even heating while reducing hot spots. 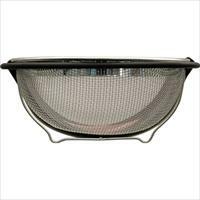 Tempered glass lids allow for monitoring the cooking process without lifting lids and releasing moisture. 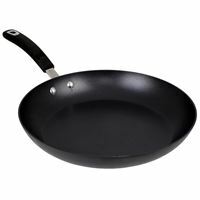 Soft Grip Handles, Non Stick Interior - PFOA/PTFE FREE. Dishwasher Safe, Oven Safe to 350 degrees Fahrenheit. Uses: Gas, Electric, Halogen, Ceramic, Induction. 10 Year Warranty, English/Spanish Packaging. 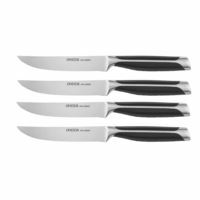 Features the four most commonly used knives in food preparation. 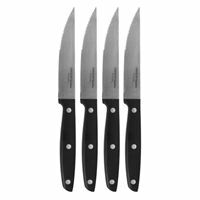 6" Cook's, 5 ½" Utility, 5" Santoku, 3 ½" Parer. Hygienic ABS Handles – Forged Bolsters. 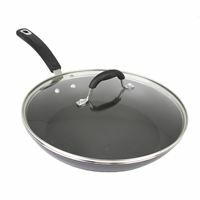 Includes: (2ea) 9" Round Cake Pan. Heavy Duty Carbon Steel Construction (.6mm). Whitford Xylan non-stick coating offers easy release of baked goods and easy clean-up. Silicone Handles for Easy Gripping. Oven safe to 400 degrees. Dishwasher Safe. Made without PFOA, Lifetime warranty. 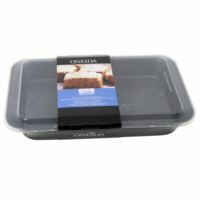 Includes: (2ea) 8" Square Cake Pan. Heavy Duty Carbon Steel Construction (.6mm). 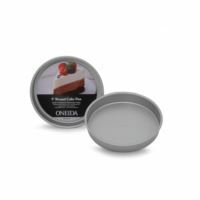 Whitford Xylan non-stick coating offers easy release of baked goods and easy clean-up. Silicone Handles for Easy Gripping. Oven safe to 400 degrees. Dishwasher Safe. Made without PFOA, Lifetime warranty. 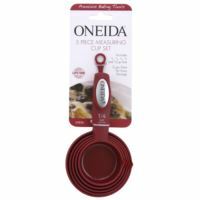 Includes: (2ea) 9" Round Cake Pans. Heavy Gauge Aluminized Steel (.6mm). Whitford Xylan non-stick coating offers easy release of baked goods and easy clean-up. 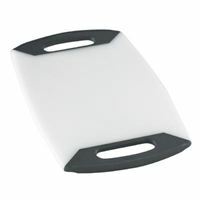 Reinforced Folded Corners on Cake Pans for Professional Results. Oven safe to 400 degrees. Dishwasher Safe. Made without PFOA, Lifetime warranty. Durable Aluminum vessels promotes fast and even heating while reducing hot spots. 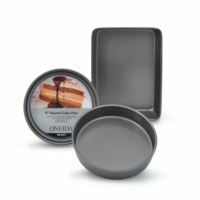 Tempered glass lids allow for monitoring the cooking process without lifting lids and releasing moisture. 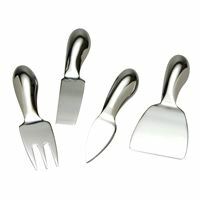 Solid stainless steel riveted handles with soft grip sleeve. Whitford QuanTanium non-stick coating – 3 layer coating with titanium reinforcement. PFOA/PTFE free. 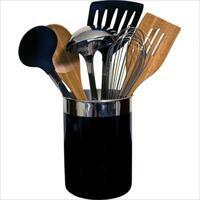 Metal Utensil Safe, Dishwasher Safe, Oven Safe to 350 degrees Fahrenheit. Uses: Gas, Electric, Halogen, Ceramic. 10 Year Warranty, English/Spanish Packaging. 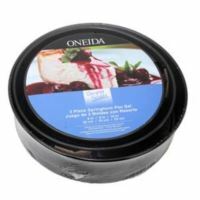 Includes: (2ea) 9" Round Cake Pan, (1ea) 9" x 13" Cake Pan. Heavy Duty Carbon Steel Construction (.8mm). Whitford Xylan non-stick coating offers easy release of baked goods and easy clean-up. Silicone Handles for Easy Gripping. Oven safe to 400 degrees. Dishwasher Safe. Made without PFOA, Lifetime warranty. Serrated blades never need sharpening. Ergonomic handles prevents slippage. 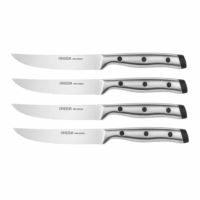 Incl: 8" Slicing, 8" Chef, 5" Mini-Chef. 5" Utility, 3" Paring. (6) 4 1/2" Steak Knives. Labeled Slots on Rubberwood Block. Hand washing recommended. Limited Lifetime Warranty. 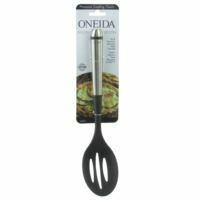 Includes: 18/8 Stainless Steel Whisk, Silicone Spatula has 18/8 Stainless Steel Handles and NylonHead that is heat resistant to 450. Nylon Tools (Turner, Slotted Turner, Spoon and Slotted Spoon) have 18/8 Stainless Steel Handles. Nylon is heat resistant to 450.